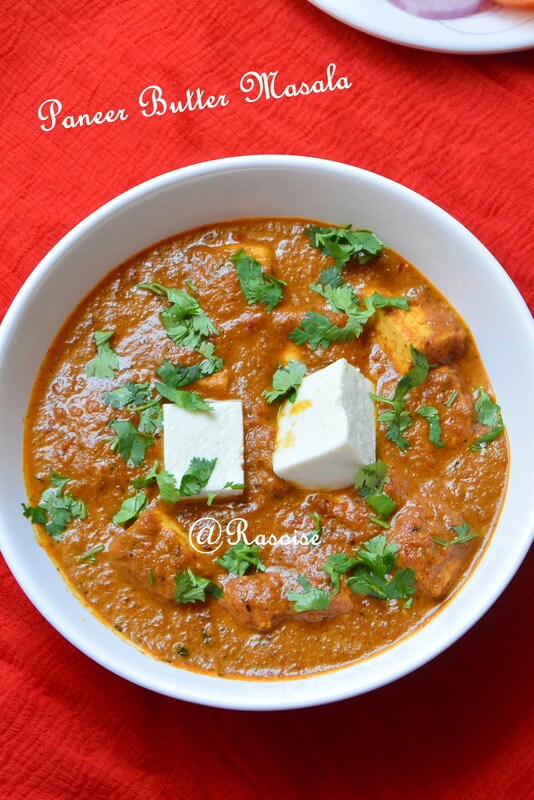 Paneer is a must ingredient in our diet atleast once a week. 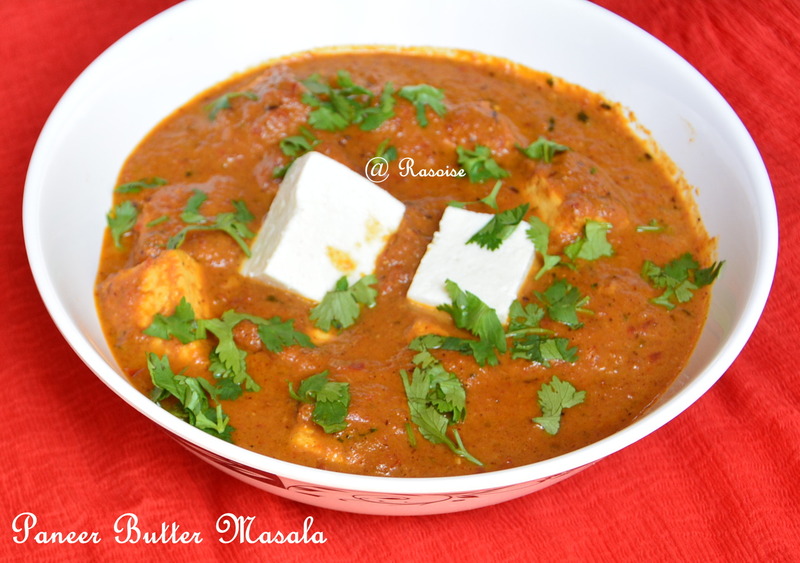 Last week I tried Paneer Salsa Tortilla Wrap, and this week it was Paneer Butter Masala. 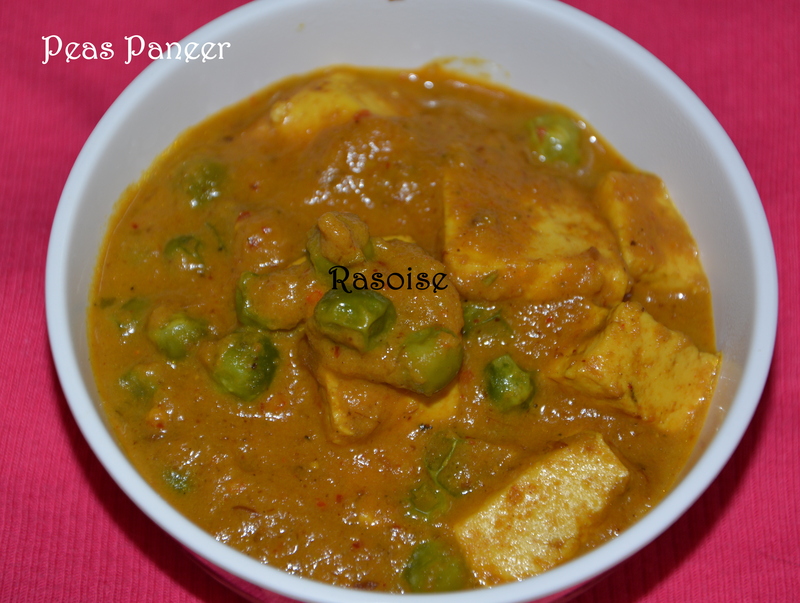 I have also posted before Peas Paneer akka Matar Paneer. 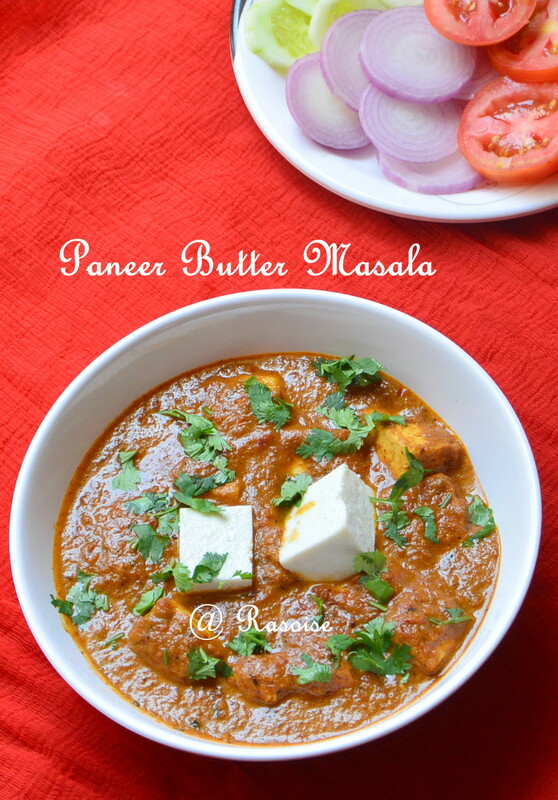 Paneer Butter Masala is generally served with tandoori roti / Naan / Garlic Naan / Onion Kulcha in most of the restaurants. I love it with garlic naan. 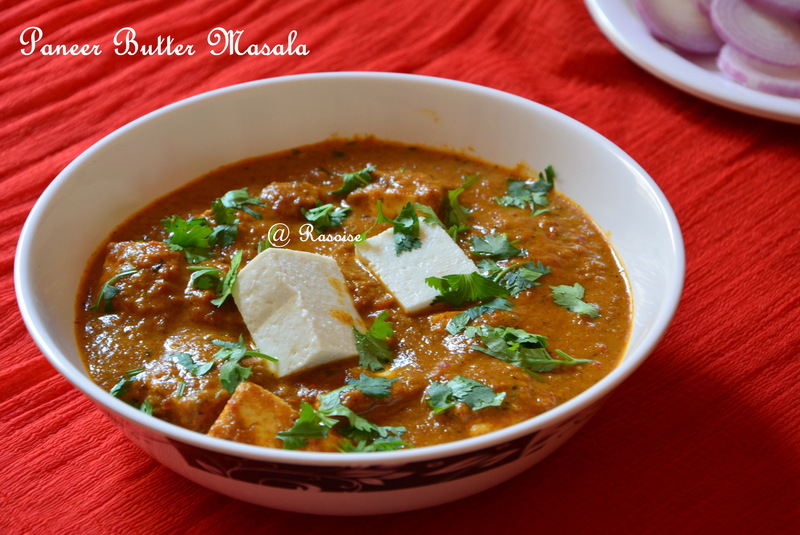 Paneer Butter Masala is paneer pieces dipped in onion tomato gravy flavored in butter. It’s a must try recipe. 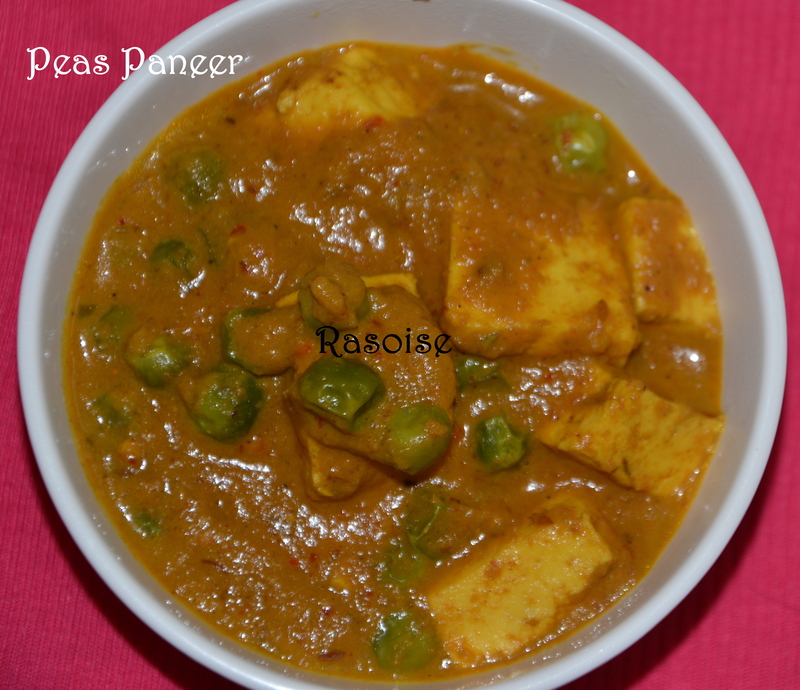 Cut paneer into big cubes. Soak cashew nuts in warm milk for some time. Grind it to a smooth paste. Grind chopped onions with ginger garlic paste to a slightly coarse or smooth paste. Heat oil and add 2 tbsp butter and add green chilli, onion, garlic paste mixture and saute until it turns light brown and the raw smell goes. Add tomato puree and saute until the mixture becomes really thick and oil separates from the mixture. Saute the tomato mixture until it leaves the pan and make sure masala is not burning at any stage. Add roasted cumin powder, sugar, salt, coriander powder, red chili powder and turmeric powder and mix well. Add milk and boil it for approx ten minutes or till the oil separates and the gravy dries to make thick masala gravy. Now add the ground cashewnut- milk mixture and fresh cream. Add kasuri methi and garam masala. Add remaining butter and paneer pieces and give it a stir. Garnish with coriander leaves. Serve hot with Naan, Kulcha or parantha! !